I've moved this image around my desktop for 2 years. I'm not sure why I never filed it, nor why I hadn't posted it, but yesterday's weather had me dreaming of riding again so today's the day. It's one of my favorite places from my bike rides around Brooklyn. The ride that takes me up Myrtle to Marcy and a quick right, there they are. Always busy. Always smiling. 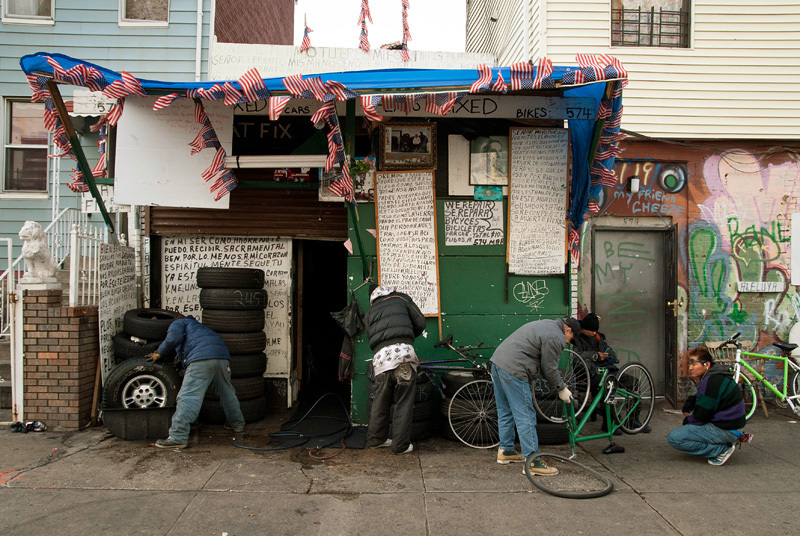 Along with all of their signs hangs many photographs by other photographers, let's just say it's a well photographed tire shop. For me it's security, the roads of Brooklyn are torture on a bike tire and it's nice to know I can get a quick fix and be on my way.